Home » Basic Mech. 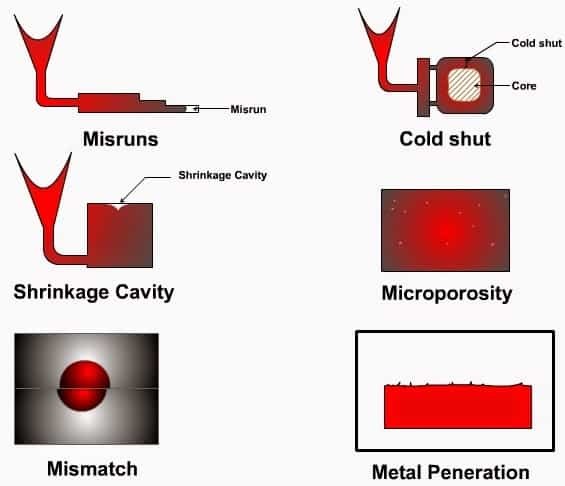 Concepts » What are the Casting Defects ? category can be classified into blowholes and pinhole porosity. mixture, and excessive moisture present in the mold. this reason risers are placed at the appropriate places in the mold. The defects in this category are cuts and washes, metal penetration, fusion, and swell. be overcome by the proper design of the gating system. the gaps between sand grains, the result is a rough casting surface. pouring temperature is too high. to the extremities of the mold cavity before freezing. Long, thin sections are subject to this defect and should be avoided in casting design. fronts will have to flow together and become one solid. If the flowing metal fronts are too cool, they may not flow together, but will leave a seam in the part. The mold shift defect occurs when cope and drag or molding boxes have not been properly aligned. It results in a mismatching of the top and the bottom parts of the casting , usually at the parting line. It is an enlargement of the mould cavity by molten metal pressure resulting in localized or general enlargement of the casting. are thin projections of the metal not intended as a part of casting. These usually occurs at the parting line of the mould. It usually occurs near the in the gates as rough lumps on the surface of a casting. It is an internal or external ragged discontinuously in the metal casting resulting just after the metal has solidified. It is smooth depression on the outer surface of the casting work piece. These are smooth depression on the upper surface of the casting. They usually occur near the ingates. These are patches of sand on the upper surface of the casting component. These happens when the mould cavity is not completely filled by the molten and insufficient material or metal. These permit drainage of the metal from the cavity and result in incomplete casting.